13.9 x 11.4 x 8.8 cm. This impressive, cabinet plate is studded with two generations of tapered quartz crystal sprays, presenting a distinctive porcupine quill-like appearance. 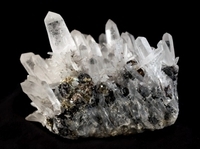 The first generation of larger crystals, dominated by the 5.0 cm crystal, have a satiny lustre and finish, while the second generation crystals are very glassy and water-clear. 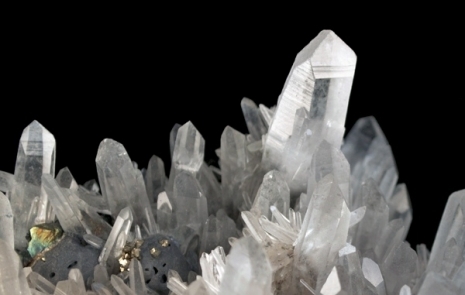 Poking through the quartz sprays are a few, melted-look galena cubes, iridescent chalcopyrite and small, brass-yellow pyrites. 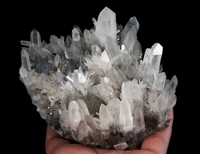 The matrix is a mixture of quartz and sulfides. From the peak of Alimon Mine specimen production in the 1980s. Ex. Robert Whitmore Collection.